Looking for something to put on, around, or near a microphone? We've probably got it. Please note that boom poles and microphone flags and printed windscreens have their own pages. 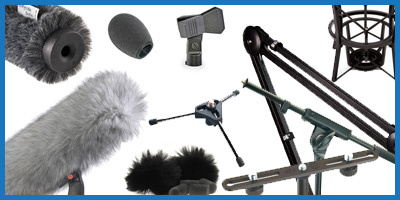 Below you will find links to just some of the microphone accessories that we carry in addition to the model specific items provided by the manufacturers. If you don't see what you're looking for listed below, please contact us for further assistance.